26.2 Quest: Blisters, how do you deal with them? I find it funny that I am even writing about blisters. I have never had a blister on either of my feet or toes since I started running almost 4 years ago. Now, I have had the occasional sore toe, and of course really sore feet, but never a blister. Over the past few weeks I have been doing a lot of walking as a supplement my running. This walking is completely unrelated to running and is for a contest we have going on at work over the summer. The funny thing is that this walking has given me multiple blisters. I am sure it is because my feet move around differently in my shoes when I walk, rather than run. I wear my moisture wicking socks when I walk as well so I am doing everything I can think of to try and keep these blisters at bay..... but to no avail. One other thing that I am sure is a contributing factor is the humidity these last couple months. The humidity has been 80% + almost consistently, with many of the days being over 90%. With this humidity almost every time I head out to walk or run I come home with wet shoes, I am sure just exasperating the problem. I currently have two quite large blisters. Over this time these have been reoccurring, as well as a few others on a few other toes. 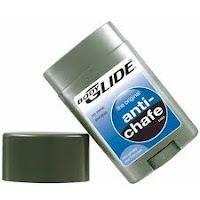 To deal with them once they are there I have been using BodyGlide to keep the friction down. I have also got to the point where I use BodyGlide on my toes each time I go out for a walk or run. This is not good, because I am going through my BodyGlide much faster than I want to! What do you do to ward off blisters? But more importantly at this time, how do you deal with them once they are there? Do you just leave them or do you pop them? I really don't know what to do with them and would love to hear everyone else's home remedies. Just so you know.... I contemplated using a picture of a blister on a toe for this post. I found some pretty disgusting ones too! But, I chose to take the high road and spare you the experience. ....did you see? Me? Sponsored by Sony? I rarely get blisters while running, but if I go on a long walk... they hunt me down. Not sure how to prevent, and they usually pop on their own shortly afterwards, at which point I clip the excess skin off. Gross, I know, but you asked... Hope you're having a great summer! Thought of you when I ran the trails at Stone Mountain Park yesterday. I've had many blisters this summer, as I think some of my shoe experiments have backfired. I've seen advice that if they are larger than around 1/4" diameter, they should be popped then covered. Some of mine have been under my toenails, particularly painful at first, but popping provides a great relief. Over time, you may develop calluses if you continue the walking. While ugly, they are certainly far more durable and less painful than blisters. Have you tried double-layer socks? I think the anti-friction properties are more important than moisture-wicking benefits. Rubbing your feet in Vaseline works as well as body glide, but can be easier to get in between the toes! I almost always pop my blisters and put band-aids over them for awhile to run. I agree with Greg that the under the toe ones should get popped as soon as possible! Have you thought about those Injinji toe socks? They keep the toes from rubbing together and I've never had a single blister with them even on dusty 50-mile trail ultras. They are a little spendy but worth every cent. If you know where they're likely to occur, a bit of strapping tape on the spot works well for me. I usually keep popping them with a sterile needle then rub neosporin on them. Otherwise they bother me. And I tend to rub body glide between my toes before any long runs to prevent them. I don't go through it too fast though, just a light 'greasing' in between my toes. First off I need to apologize for not coming back earlier and replying. I was reading them as they were coming in but was so busy (walking) that I didn't have a chance to come back by and thank you all for your thoughts and ideas. The way I ended up dealing with them was to just leave them alone as they were. They didn't bother me much as long as I kept BodyGlide on my feet whenever I knew the conditions were right to get them made at me, or if the conditions were right for new ones to be born. I really appreciated you taking the time to give me your input!